The McIntosh Group LLC provides accessibility consulting services and audits for building and business owners nationally. We are licensed architects in all 50 states, Puerto Rico, and the District of Columbia. We have experience with a variety of building types including Retail, Convenience, Banks, Hospitality, Restaurants, Movie Theaters, Residential and Office. We have extensive experience dealing with the ADA Title III, ANSI and state-specific accessibility overlays including California, Texas, Florida, Illinois, Georgia and Arizona. Throughout this education course, we will review toilet rooms according to the 2010 ADA Standards. Our team will discuss grab bar positions and measurements. 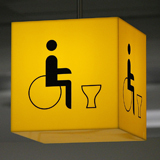 We will review water closets, knee and toe space, and lavatories according to the 2010 ADA Standards. Finally, we will discuss how California disability access requirements affect sinks & toilet room accessories. Great course for TX architects as well.